The Global Volcanism Program has no activity reports for Bolshoi-Kekuknaysky. The Global Volcanism Program has no Weekly Reports available for Bolshoi-Kekuknaysky. The Global Volcanism Program has no Bulletin Reports available for Bolshoi-Kekuknaysky. Bolshoi (Bolshoy) and Kekuknaysky are two large, partially overlapping basaltic shield volcanoes located NW and NNW, respectively, of Uksichan volcano. The massive shield volcanoes are of Pleistocene age and were constructed west of the axis of the Sredinny Range. Hawaiian-type calderas are located at the summit of the volcanoes, and numerous youthful cinder cones dot their flanks. 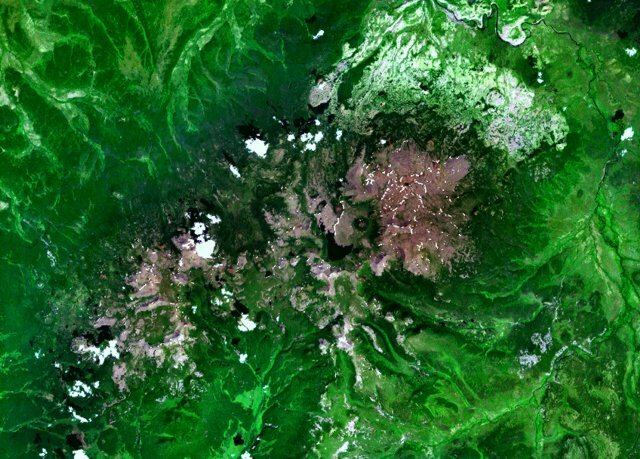 The summit caldera of Bolshoi is breached by four radial valleys, whereas the 6-km-wide caldera of Kekuknaysky (also known as Leningradets volcano) is breached to the north. Young cinder cones and lava flows are particularly abundant on the NE flank of Kekuknaysky volcano. Kekuk crater on the lower northern flank erupted about 7200 years ago. There is no Deformation History data available for Bolshoi-Kekuknaysky. There is no Emissions History data available for Bolshoi-Kekuknaysky. Two overlapping shield volcanoes are located NW of Uksichan volcano, west of the axis of the Sredinny Range. Bolshoi (lower left), also spelled Bolshoy, is breached by four radial valleys and is the more eroded of the two volcanoes. Kekuknaysky (right-center), also known as Leningradets volcano, contains a 6-km-wide Hawaiian-type caldera breached to the north. Young cinder cones and lava flows are particularly abundant on the NE flank of Kekuknaysky volcano, forming the broad less vegetated area outside the caldera. 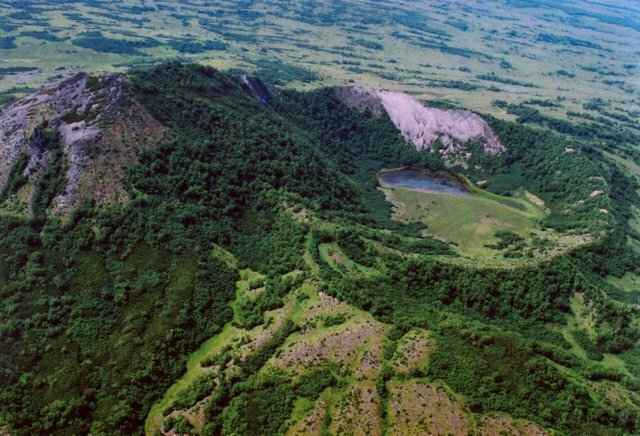 Kekuk crater on the lower northern flank of the Bolshoi-Kekuknaysky volcanic complex erupted about 7200 years ago. The 1-km-wide crater formed on the flank of a lava dome (left) which likely was erupted immediately prior to formation of the crater. Bolshoi (Bolshoy) and Kekuknaysky are two large, partially overlapping Pleistocene basaltic shield volcanoes located NW and NNW, respectively, of Uksichan volcano and are dotted with numerous youthful cinder cones on their flanks. There are no samples for Bolshoi-Kekuknaysky in the Smithsonian's NMNH Department of Mineral Sciences Rock and Ore collection. Large Eruptions of Bolshoi-Kekuknaysky Information about large Quaternary eruptions (VEI >= 4) is cataloged in the Large Magnitude Explosive Volcanic Eruptions (LaMEVE) database of the Volcano Global Risk Identification and Analysis Project (VOGRIPA).